We're claiming this as one of the year's best tips: eat more bacon to burn fat. It's the kind of spurious headline you'd expect to see on Epic Meal Time, but scientists at Kyoto University have found evidence to bring joy into every man's kitchen. 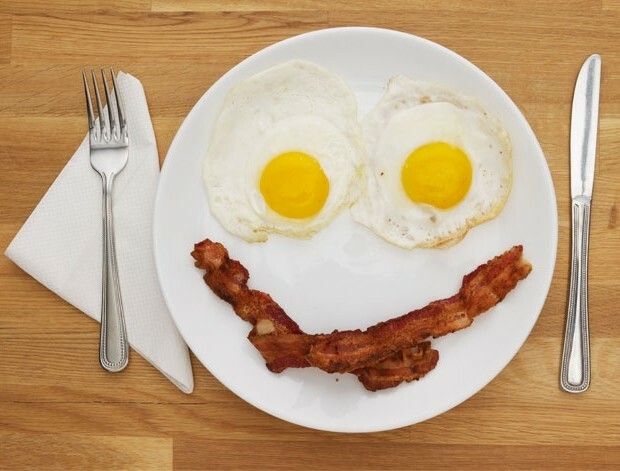 It turns out that bacon is a source of the hormone coenzyme Q10, which knocks your metabolism up a gear; especially when combined with light exercise. And by light, we mean a brisk walk, not a few rounds in the squat rack. Around 30mg - or six rashers of smoked back - an hour before exercise leads to double the fat burn of a leisurely stroll, meaning your breakfast could burn itself off as you rush for the train. Whip up a fry-up with Q10-containing extras such as spinach and avocado, topped up with one tablet to reach your 30mg. But don't be too rash: once you've upped your bacon intake for more than a week, it becomes counterproductive. Alas, all good things must come to an end. On your back, raise your arms with your legs at a 90-degree angle. Tense your core and lower each limb to an inch off the floor. Return; swap sides. Start in an inverted V and glide your chest down and up between your hands toward the ceiling, without touching the ground. Then reverse. Leaning forward, raise your leg back and tap the floor with your adjacent arm. Now reach for the ceiling without stepping down. Swap sides.